We hope the sympathy messages and sample sympathy letters will help you find the writing wording for your bereavement card. • I was so very sad to learn of your loss. May you find hope with each passing day and your smile along the way. Our deepest sympathies go out to you during this sad time. • Such a loss as yours brings on such a rapid, tremendous, heart-wrenching change. This type of change can never be easy. May your heart find joy again in due time. • Our deepest sympathies for your loss. May you remember them fondly with love and happiness, and may your heart be freed from sadness in due time. • Love is difficult when we are faced with such a loss. May you relish the memories of your loved one, and always be thankful of the times spent together. • Love makes the world go round. At times of loss like this, love feels more like a heart ache. Yet, we must always remember the beauty that those lost have brought into our lives. Our deepest sympathies are with you at this time. It’s hard to write words of condolence especially if you do not know what to say first. 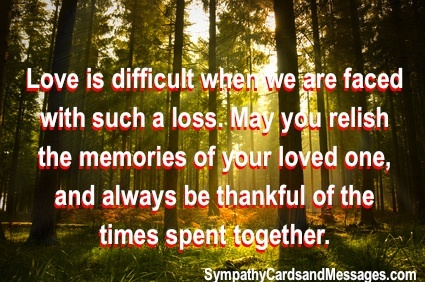 But it is essential to send a message or card to let them know that you care and how the deceased person means to you. It is a great idea if you involve something personal like a fond memory you shared of the person who has died.